Paul Harris Boardman ’89 (left) and posters from films he has written and produced. Paul Harris Boardman ’89 doesn’t scare easily, but he knows how to terrify people. In fact, he does it for a living. Boardman, who received a master’s degree from the Krieger School’s Writing Seminars, is a Hollywood screenwriter and producer of horror films. 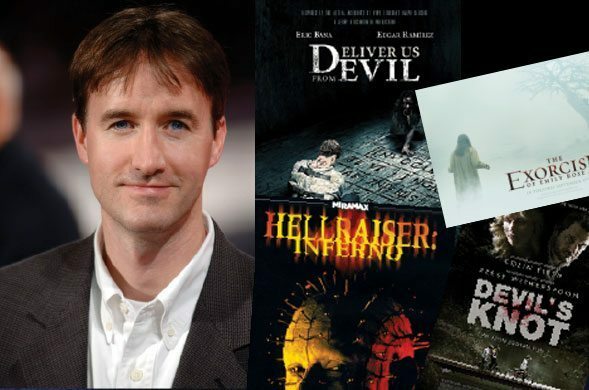 His best-known works include The Exorcism of Emily Rose, Hellraiser: Inferno, Devil’s Knot, and Deliver Us From Evil. Growing up in Southwest Virginia and East Tennessee, Boardman became enamored with the horror genre, reading Edgar Allan Poe and watching such films as Halloween and Alien. He attributes his fascination with the macabre, thrillers, and the supernatural to a peripatetic youth. A graduate of Sewanee: The University of the South, Boardman came to Johns Hopkins primarily to study poetry, though he already had screenwriting on his mind. After taking a class on Hitchcock with media studies Professor Mark Crispin Miller and working as an actor during an intersession program with playwright Edward Albee, Boardman felt certain of his new direction and decided to pursue filmmaking. After attending the University of Southern California School of Cinema-Television, Boardman started working on suspense and horror scripts with fellow filmmaker Scott Derrickson. They soon developed a reputation for that genre, particularly after working on a script for a horror film titled “Darkness Falling” that never reached the screen but helped raise their profiles in Hollywood. With horror films, Boardman says certain formulas tend to work best. Naturally, they should build up suspense and deliver “scares” on a fairly frequent basis, he says. But Boardman generally avoids horror film formulas and clichés. Boardman says The Exorcism of Emily Rose is his favorite work among his oeuvre. He says the 2005 film, starring Laura Linney, Jennifer Carpenter, and Tom Wilkinson, comes closest to what he had in mind for the story from the outset. Boardman is currently working on film adaptations of James Patterson’s Guilty Wives and Catherine Nixon Cooke’s Tom Slick, Mystery Hunter; the latter he describes as “Indiana Jones meets King Kong, laced with a bit of Cold War intrigue.” He is also writing a TV miniseries based on horror master Stephen King’s The Tommyknockers. In addition, Boardman, who lives with his wife and two children in the Los Angeles neighborhood of Los Feliz, recently inked a deal to write a film adaptation of C.S. Lewis’ 1942 novel The Screwtape Letters. He also has a spy thriller in the works. “I’m a little overbooked at the moment, which is a good problem to have,” Boardman says. “In this business, you want to have a lot of things cooking because you don’t know what’s going to come to a boil. You’re only as good as the next thing you have lined up. Damien Newton '99 is editor and founder of Streetsblog Los Angeles, a nonprofit news site that addresses livable street issues and transportation policies. Deborah Jeffrey ’82 serves as inspector general of the Corporation for National and Community Service, the nation’s largest grant maker for service and volunteering. Peter Fuentes ’01 founded Dental Groups of New Jersey, which now includes five dental practices, several in poverty-challenged, underserved cities. Paul Harris Boardman '89 doesn’t scare easily, but he knows how to terrify people. In fact, he does it for a living. First Comes Love, Then Comes Marriage…Not So Fast.